Good Morning a quick post this morning. 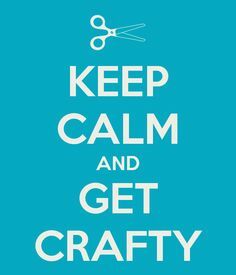 I had a extra day off over the holidays and I will spend some of it in my craft room. 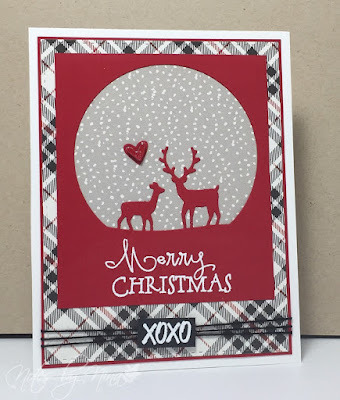 This is the last of the Christmas cards I made for this year. No fear, there is a great line up of Merry Monday Challenge on the roster. 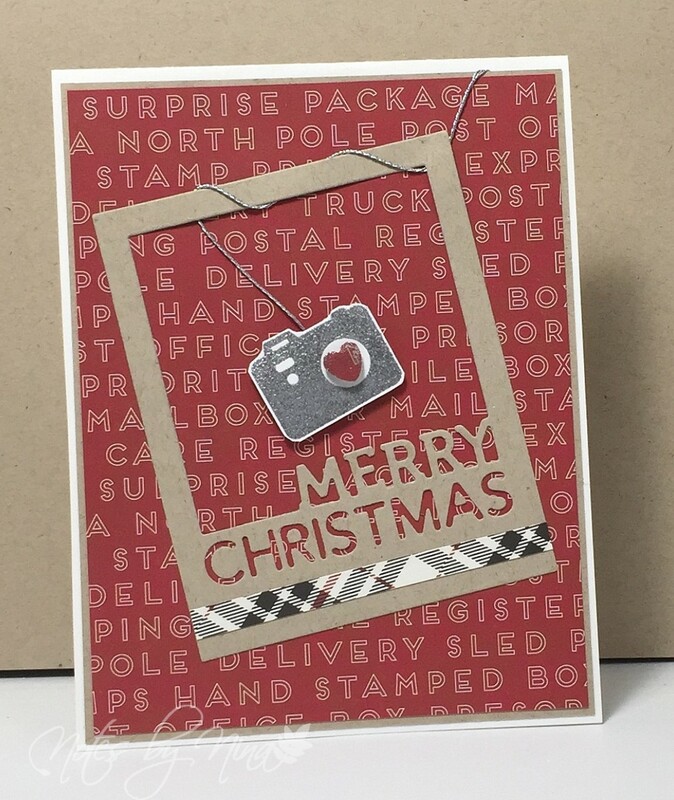 This card was created for my son who has a love of his camera and takes some amazing photos. I heat embossed the camera in silver then fussy cut it out. I added the popped up hear and used some silver twine. I cut the frame from craft cardstock and added a small strip of patterned paper. 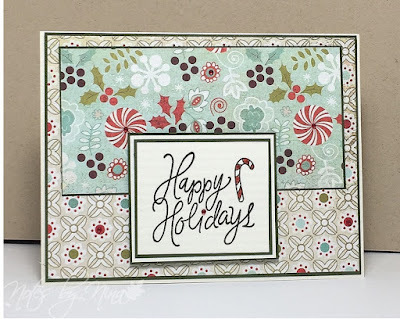 Supplies: White and kraft cardstock, Designer Paper - Carta Bella, Simon Says Stamp - Holiday Frames. 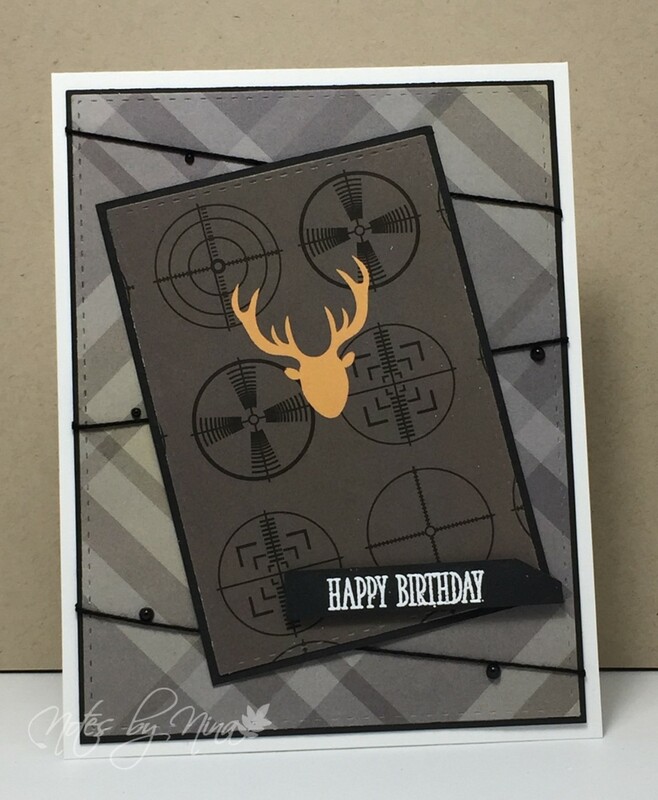 I love the Little B stickers, they make for wonderful CAS cards, or fun embellishments. This package of Classic Nutcrackers is fabulous. 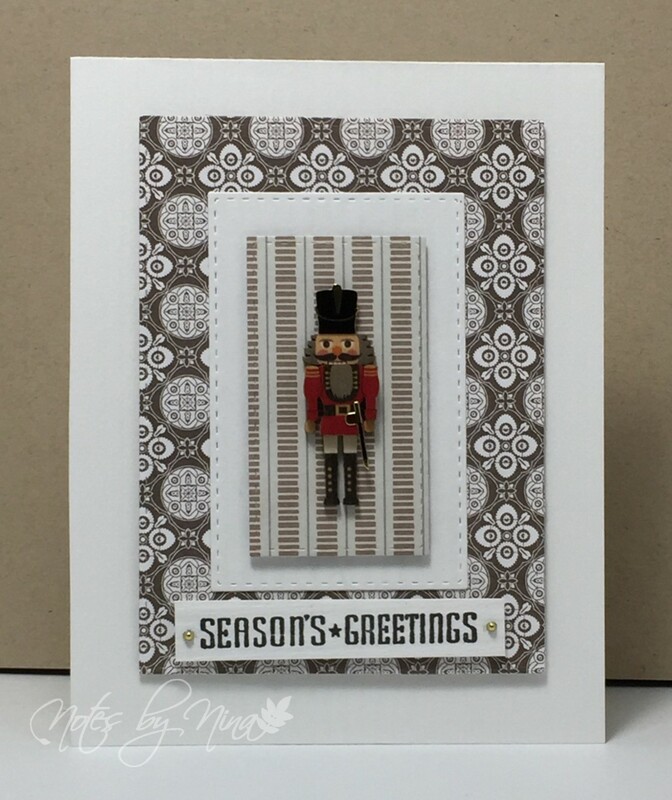 Layers, this whole card is just layers - patterned papers, cardstock and foam tape and topped with this 3D little nut cracker. Good morning and happy Friday, I have a quick post today. Isn't this panel pretty, I am letting the paper do all the work on this card. I added a background panel then a second layer with the strip down the center and finally the showcase layer which is popped up with foam tape. Each layer had a border of gray. I finished with a small silver bow. Supplies White and grey card stock, Designer Paper - Pion. twine. Even when it come to cards there are some who leave it to the last minute :). I had a request from a co-worker for a Coke Santa card yesterday, but in the middle of all the fuss it was fantastic to get some time in my craft room. This ol' gent is not the quite what was requested but he looks pretty great to me. The request was to have perhaps a present in behind, I did not quite manage that but I did alternate some stitched squares and rectangles and I have some nice texture in the background. I popped up the Santa panel and filled in a little of the blank space with some greens and a red gem. 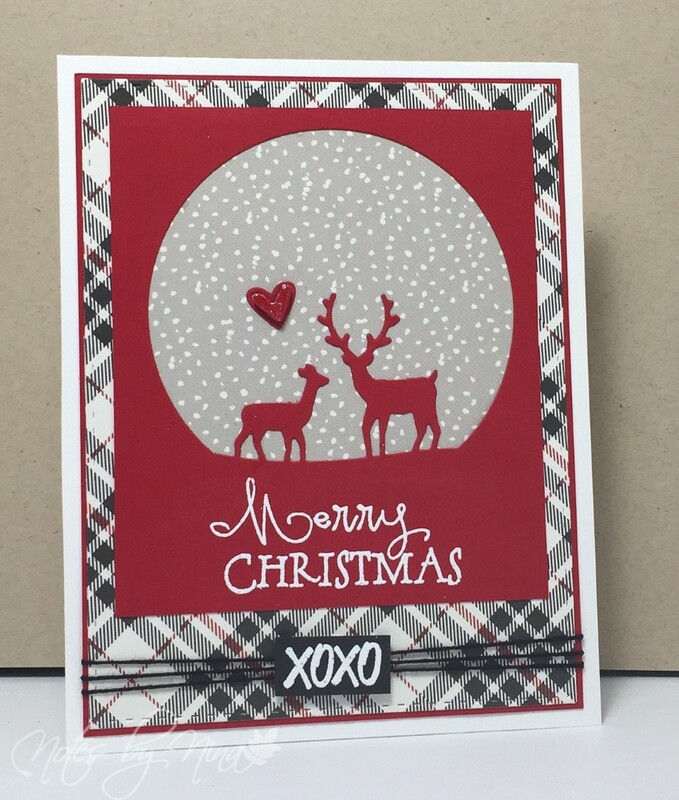 Supplies: White and Red card stock, Designer Paper - Authentique, SSS Stitched dies, branch punch, gem. 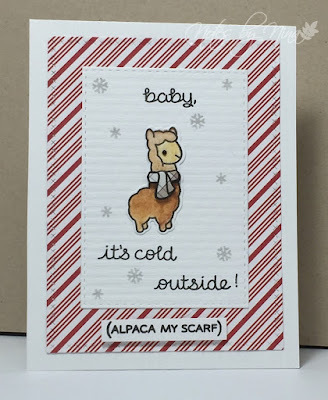 Baby, it is cold outside. We are almost back to our 'standard' winter here in Victoria, well at least we will be when the wind storm moves along. Last week through we had freezing temps and snow.. for more than a day... I will stop now ;). 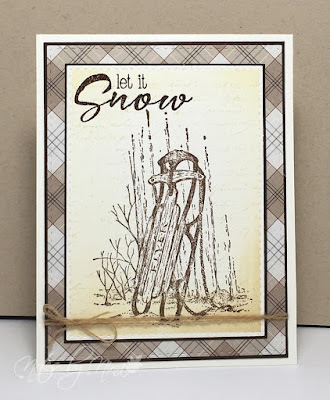 I pulled out this adorable little stamp set for a CAS card. Easy peasy lemon squeezy, die cut, stamp, die cut some more, colour, glue, foam tape, SPARKLE and done. 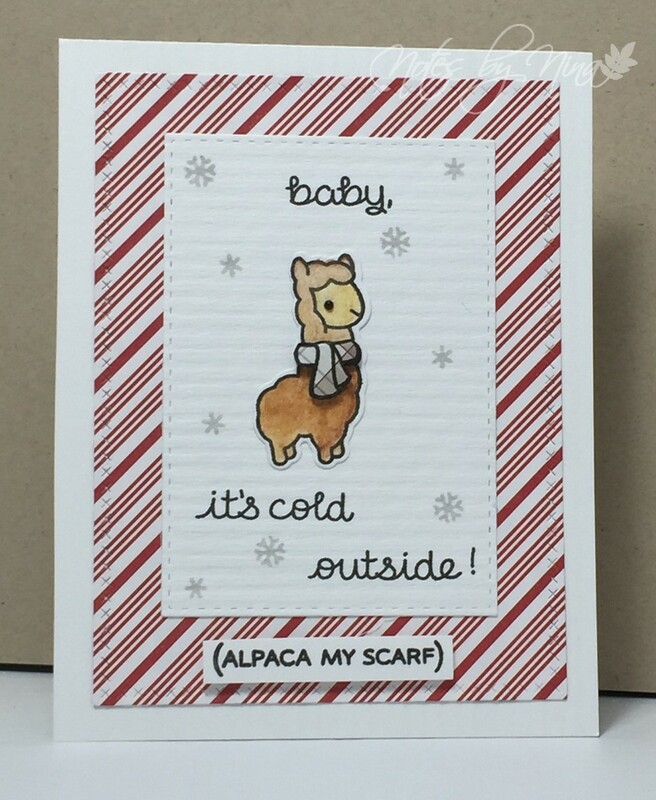 Supplies: White cardstock, Designer Paper - Echo Park, Lawn Fawn - Winter Alpaca, Stitched Die Cuts - Simon Says Stamps. 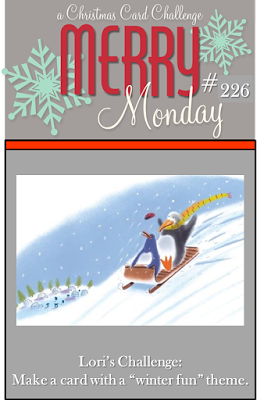 We have a new Merry Monday Christmas Card Challenge. I am your our hostess this week and my challenge is to Use Create a Christmas card with holiday cheer on it. 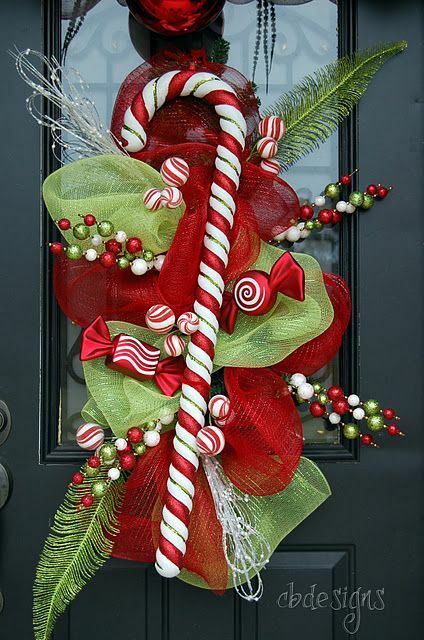 This will be our last regular challenge for this year, we are taking a break till January to enjoy the holiday season. We return early 2017. As I was searching for an inspiration image this one made me drool a little, the recipe is called Campfire Cocktail and I would love to try it over the holiday season. Truth be told its the fun favours at a certain coffee house that tempt me the most. Creme Brulee, Gingerbread latte.. you get the idea. At this point in the season CAS cards tend to work best for me when schedules get a little muddy. I used stitched squares for both panels. I stamped the mug and sentiment then stamped the mug a second time. I used a luminesce Marvy pen for the cup. 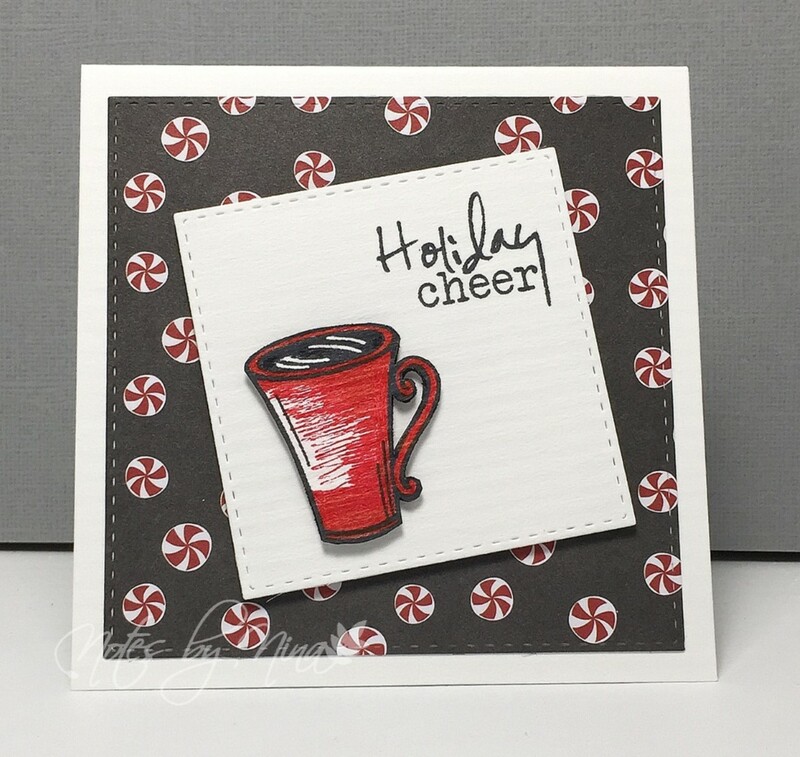 Supplies: White card stock, Designer Paper - American Crafts, Verve - Joyous Noel and Coffee, SSS die cuts. Good Morning and happy Friday. I have another short post this morning. I found this stamp set in my stash and I was determined to created with it. 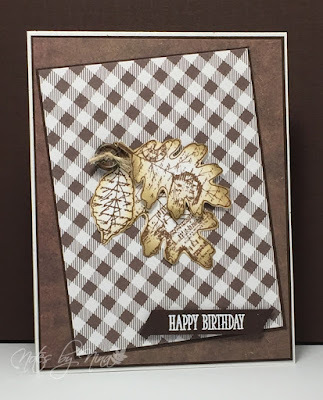 I stamped the leaves with brown ink then fussy cut them out, I added foam tape to the top leaf to add some dimension. I heat embossed the sentiment and popped it up as well. 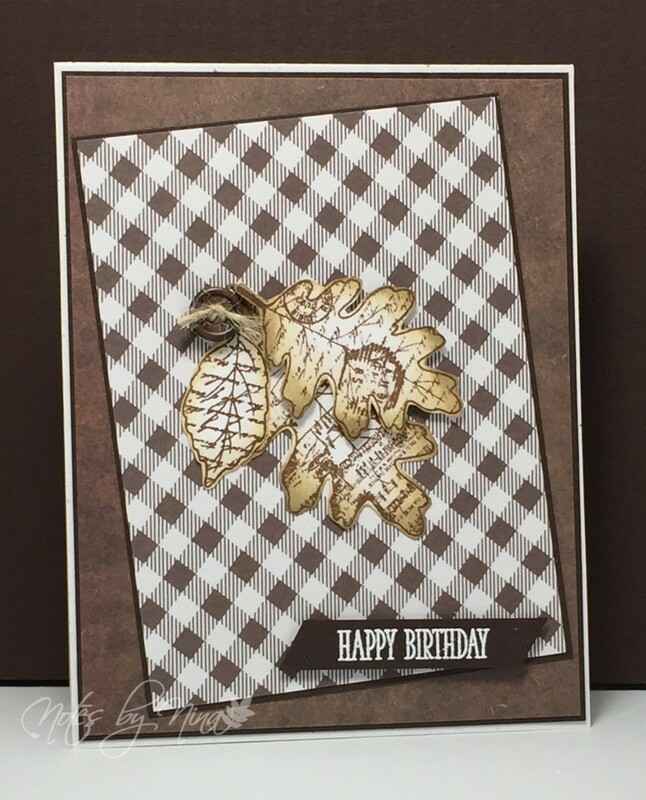 Supplies: Cream and brown card stock, Designer Paper - Jen Hadfield, Clearly Besotted - Many Mini Messages, Just Rite - Shabby Chic Autumn Leaves, button. We are on the cusp of the last shopping weekend before Christmas, be safe and good luck out there ;). 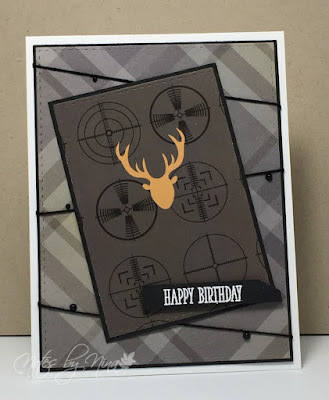 Good Morning I have a short post this morning with a masculine birthday card. I used an nice and simple layout, added some twine on the background with some black half pearls and finished with an embossed sentiment. Supplies: White and black cardstock, Designer Paper - Realtree, Clearly Besotted - Many Mini Messages, twine and pearls. 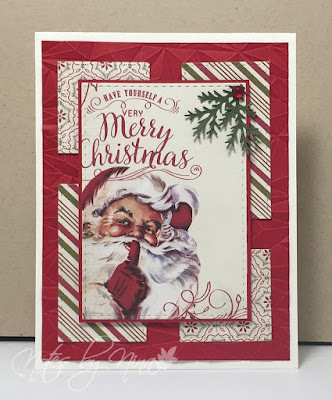 Good Morning, we have a new challenge over at Merry Monday Christmas card challenge, Lori is our hostess this week and her challenge is to Make a Christmas card with the theme "winter fun". Did you have one of these sleighs growing up, I did. I can still remember my wet mittens sticking to the metal rails as I dragged it back up the hill for what must have been the 100th time. We would end up changing mittens and snowpants half way through the day and might end up with bags in our boots because we had spent so much time out in the snow and they were soaked. Chaffed and wind burned cheeks was something to be proud of. 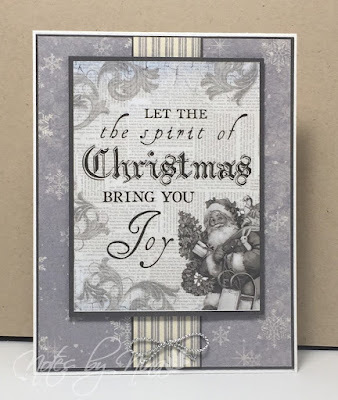 I stamped the faded text background then added a little distress ink to the edges, I used my Misti to stamp the sled image. The sentiment is heat embossed in brown. I added a layer of brown plain DP and finished with some soft twine. 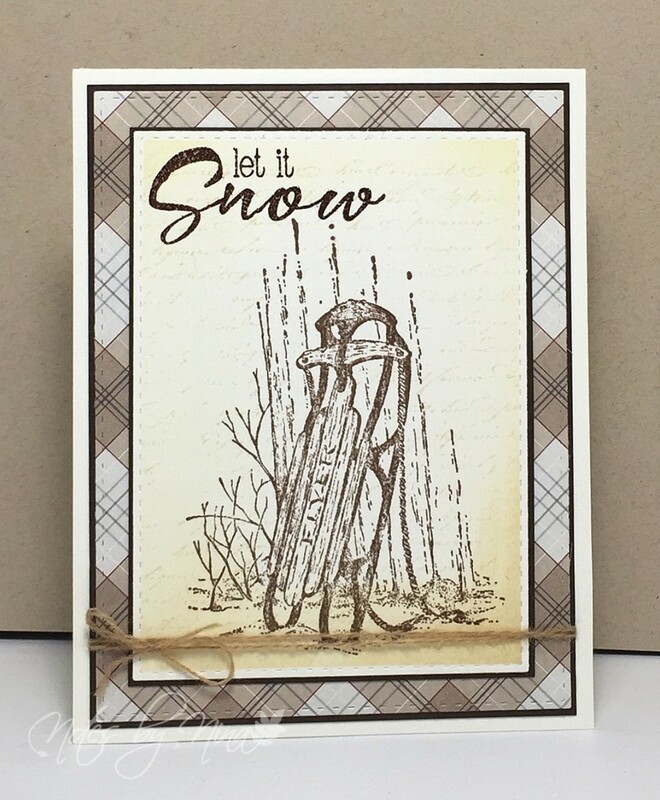 Supplies: Cream and brown card stock, Designer Paper - Photoplay, Serendipity Stamps - Sled, Clearly Besotted - Brushed Greeting, Stampabilites - Faded Text Background, twine. 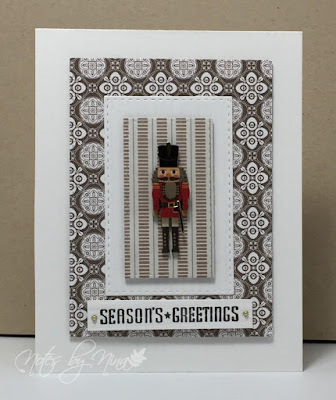 Visit the Merry Monday blog and play along with the challenge and the Design Team had some wonderful cards to share. 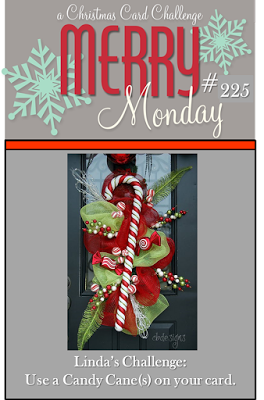 It is here.. December and welcome to a new Merry Monday, Linda is our hostess this week and her challenge is to Use a candy cane on your Christmas card. I found this designer paper buried in a paper bin and I like the colours. 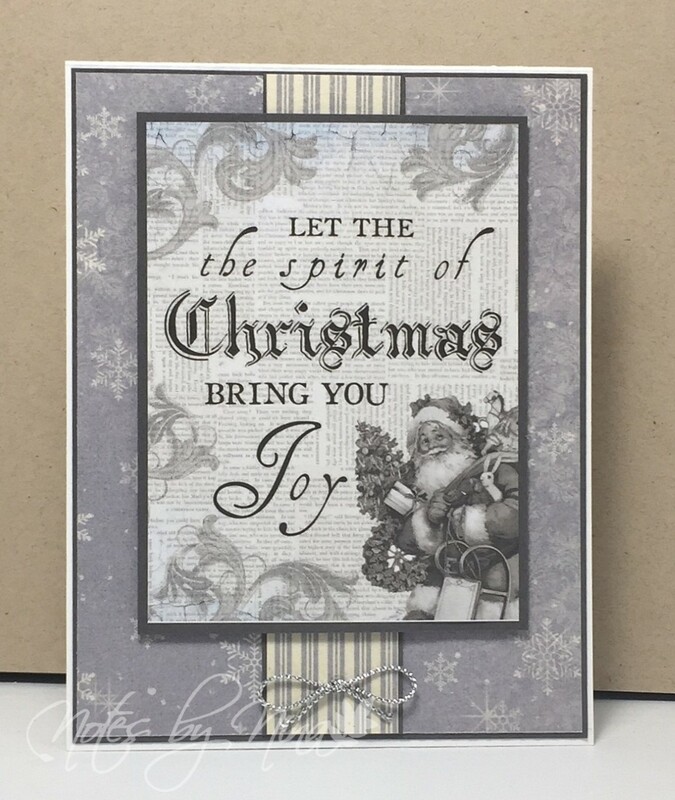 I used lots of layers and added a tiny candy cane to the sentiment. I finished with a tiny little gem. Supplies: Cream and green card stock, Designer Paper - Basic Grey, Simon Says - Gifts of Love, gem. 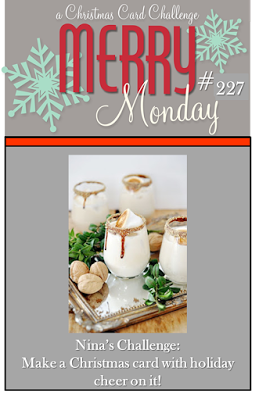 Stop by the the Merry Monday Challenge blog, the design team has lots of inspiration to share. Play along with us. Good Morning, It is a stunning day outside and I am off for a hike in a local park before a nasty storm is predicted to arrive this evening. This was a card I created for a house warming we attended. It turned out fabulously, the picture of said card not so much. 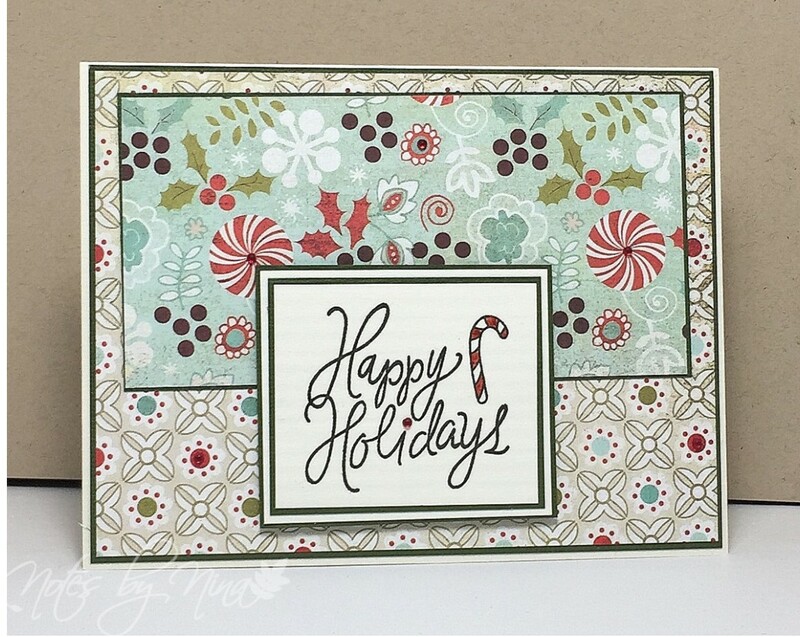 I have had this beautiful DP in my stash for a long time, I added kraft and brown cardstock layers. I die cut the Home 4 times to give it depth. I then added a little bit of distress ink to the final little kraft house. I finished with some hearts. 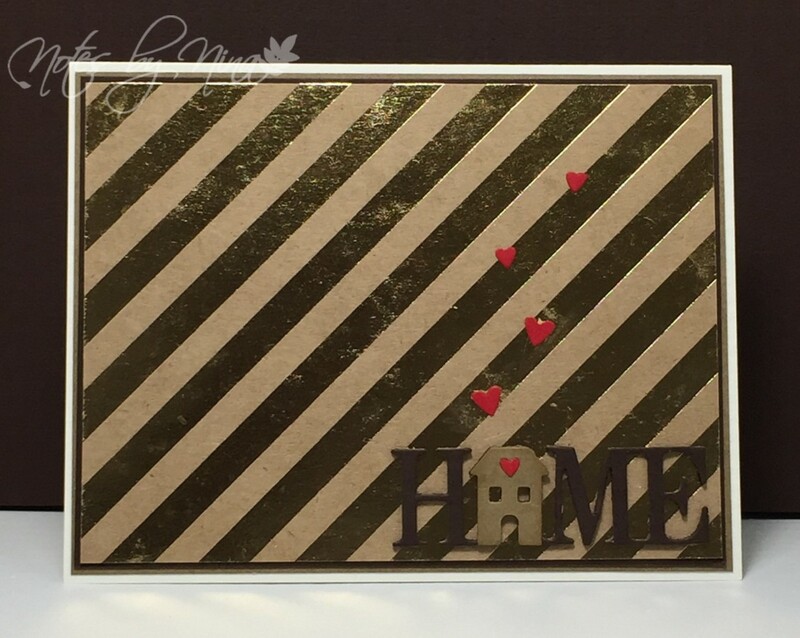 The gold foil is not actually patchy like that and it certainly muted what the Home and hearts looked like. I think the shiny gold messed with the camera and it did not matter how I tried to make it work it still turned out the same.. sigh..
Supplies: Cream, kraft and brown cardstock, Designer Paper - Bazzill, Paper moothes - Home, Memory Box - Mini Hearts. I am hoping Google University got it right because I will admit to being very unschooled when it comes to Hanikkah. 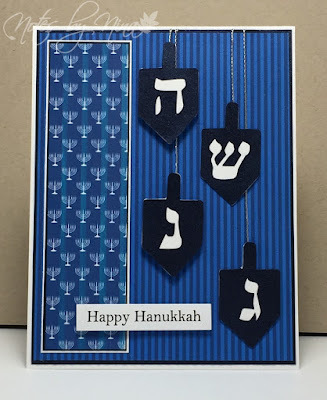 I used a thin metallic navy cardstock for the bottom layer and the top layer of the sides of the dredel. I alternated each piece adding some foam tape dimension and added silver twine in behind. I layered some printable DP and layered it. I finished with a sentiment printed from Word. Supplies: White and blue card stock, Designer Paper - LittlePandaDigitals, silver string.